This recording of bamboo flutes from Japan has a program composed of pieces from different styles and periods mainly belonging to the repertoire of the shakuhachi: shakuhachi solos, three duets which we have adapted and arranged for those different bamboo flutes; of classical tradition ((honkyoku, jiuta/nagauta) or popular (minyô) among which some great standards of the shakuhachi; a contemporary piece for flute, inspired by the language of the shakuhachi, of the American composer Elisabeth BROWN met in 2008 in Sydney at the World Shakuhachi Festival; and an original composition of mine for shakuhachi inspired by the Breton and Celtic traditions, my roots, Finis-Terrae. The booklet starts with a poem about bamboo as introduction, generously translated from the Japanese by Gunnar Jinmei Linder. 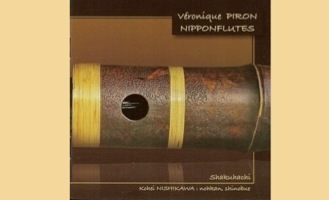 This CD comprises pieces from different styles and periods from the shakuhachi repertoire and includes three duets adapted and arranged by Véronique Piron and Nishikawa Kohei, the eminent Japanese flautist. 1. Otachi Zake This minyo piece, played on a short shakuhachi in E, is calming and unrushed. 2. Yachiyo Jishi A duet, with the short shakuhachi in E making another appearance, this time blending nicely with nohkan and shinobue, with interesting melodies reflecting$ the Kabuki feeling of the piece. The mix of flutes do not compete, each claiming its own space, but not obstructing the other. 3. Tsuru no Sugomori Véronique’s handling of the standard shakuhachi in D is splendid. This version is from Sendai in the North-East of Japan and uniquely has an improvised middle section. 4. Finis-Terrae A new and pleasing composition by Véronique Piron with Breton Celtic roots. 5. Shika no Tone An interesting interpretation of one of the most striking pieces in the shakuhachi repertoire, played with the standard shakuhachi in D, nohkan and shinobue. The different natural pitches of the three flutes provides for a wide, complementary soundscape. 6. San’An Played on a long shakuhachi in B, San’An benefits from the excellent recording skills of Pierre Daniel, capturing important nuances in Véronique’s playing. 7. Trillium A composition for transverse flutes by the composer and performer Elizabeth Brown. This modern piece is fascinating and has some great, dextrous runs, engaging the attention throughout. 8. San’Ya Sugagaki A duet with standard shakuhachi and long shinobue, with the long shinobue leaving and returning throughout the piece, stitching the piece together in an interesting way. 9. Nagamochi Uta A minyo wedding celebratory piece, played on a long shakuhachi in B, emulates the human voice with repeated finger strikes. The overall impressions received from Véronique Piron’s recording are unrushed and confident. I liked the quality of the recording. Pierre Daniel has captured a full, quite unadulterated sound, which is not too heavy on the reverb as some shakuhachi recordings can be. A lot of work has gone into this CD, by the players, the compositions and arrangements, the recording skills and the cover/booklet. Worthwhile work, producing an excellent CD.